Apparently, Red Bull teammates Mark Webber and Sebastian Vettel have kissed and made up – at least publicly – following their on-track incident late in last weekend’s Turkish Grand Prix which knocked Webber out of the lead and Vettel out of the race entirely. 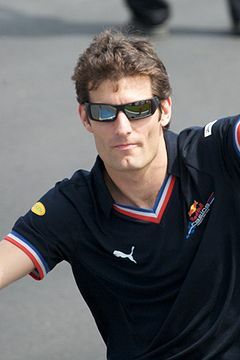 Both saw Vettel’s late-lap pass for the lead differently – Webber thought it was too aggressive while Vettel thought that he was blocked by Webber – but have issued a joint statement burying the hatchet following a meeting with team principal Christian Horner and technical chief Adrian Newey at the Red Bull factory in Milton Keynes. “It was a positive meeting, which draws a line under the incident that happened on lap 40 of the Turkish Grand Prix. The team is now fully focused on next week’s Canadian Grand Prix,” said the statement. However, more fuel was added to the fire from an outside source on Friday, as former FIA president Max Mosley pointed the finger of blame at Webber for not letting his faster teammate go past. “It is always difficult to judge a situation in which decisions have got to be made in a split second based on television footage. In my opinion, though, I don’t think that Sebastian Vettel should be given the blame for the collision,” Mosley told German newspaper Die Welt.